Getting emails from fellow curd nerds is one of the highlights of my day. Especially when it’s a swiss cheese testimonial like this one. 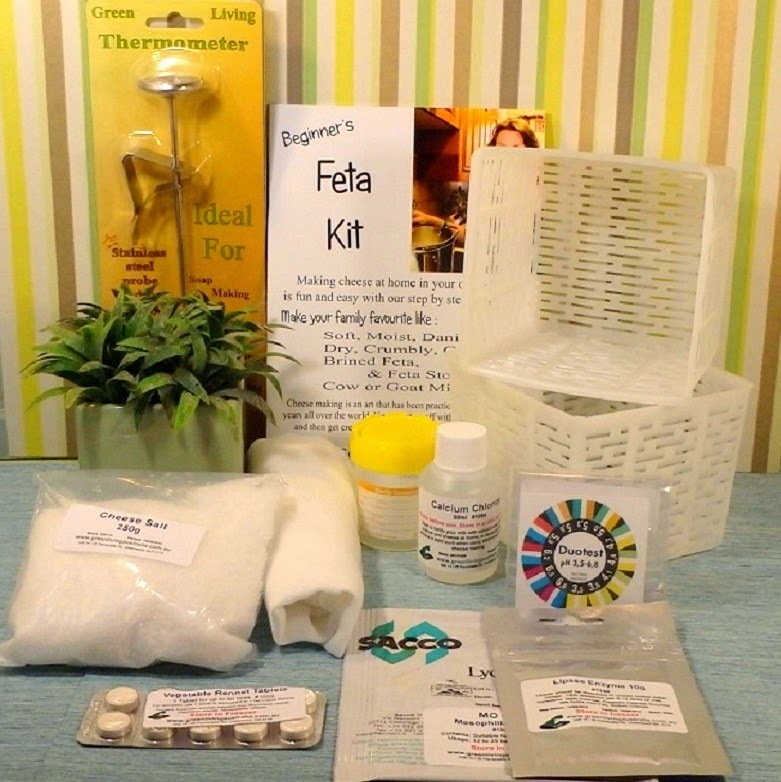 I have been interested in making soap,beer, wine, smoking meats and sausages and the like for years. I just came across one of your YouTube videos early this year and thought that I would give it a try. I had made some mozzarella and I love Swiss so after watching the video on Emmental cheese I decided to order the cultures and give it a go. I purchased what I needed, thermophilic and shermanii, animal rennet, and some other cultures from New England Cheese Co. and went to work. I have a great source for fresh raw milk and have started to make my cheese in 8 gallon 30 L batches buying 16 gal 60 L at a time. This I make in a 10 inch diameter or 25 centimeters stainless steel mold. After brining it is about 7 centimeters thick. Then I simply leave on the counter for about three weeks at around 76-80°F (26°C) and wait for the gas to cause it to swell and produce the holes. Really that is all there is to it. Please tell me what you think of these pics. Well Phil, I think your Emmental is just amazing. The rind and eye development looks perfect. The eye development is what you would expect with a cheese round that size. It certainly beats the smaller sized wheels of swiss cheese that I make. I believe that when making this cheese size does matter. The bigger the wheel, the better the eye development. For all those who missed it, you can find my swiss cheese (Emmental style) video tutorial below. The recipe is also available in my cheese making eBook, Keep Calm and Make Cheese. 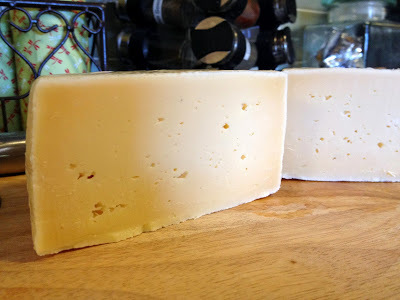 If anyone else has made cheese at home using my video tutorials, I am sure your fellow curd nerds would love to see some pictures and a brief description of how you made it here on the blog. Phil can’t be the only one out there. Who’s going to take up the challenge? Well curd nerds, the Emmental (Swiss Cheese) that I made during the recent (June 2013) video tutorial was ready to crack open. I decided that today was the big day. The Swiss Cheese taste test! Here is my analysis of this cheese. Aging; Actually, it was ready last month, but I wanted to make sure it was ready. I vac-packed this cheese after the 21 day eye development period and after wiping with a brine solution. As you can see, the four months aging period was completed last month, so technically I aged it for five months. Not a crime in the home cheese making world, just one of the ways I like to experiment with tastes and flavours. 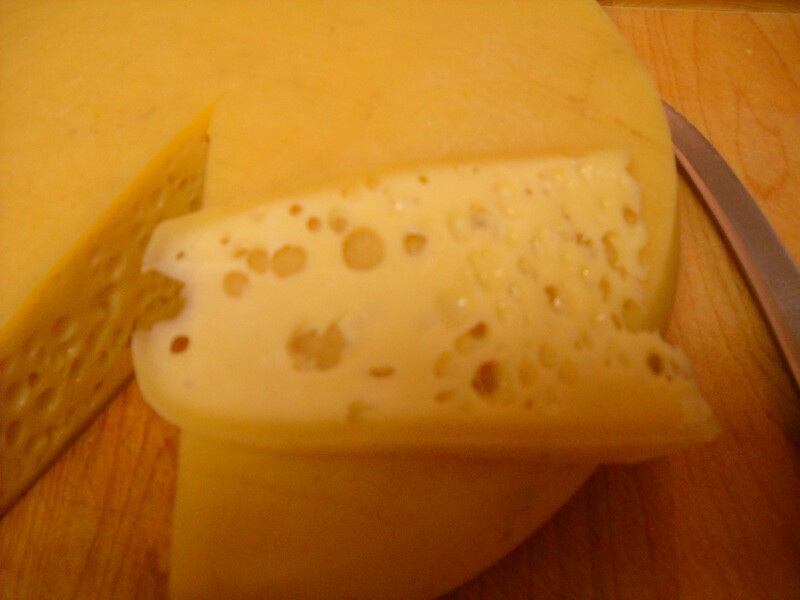 Unpacking; When I removed the cheese from the vac-pac, there was very little whey, but the cheese was moist. Texture; Now for the moment of truth. Did it have any eyes as it was supposed to? Well, yes thankfully. 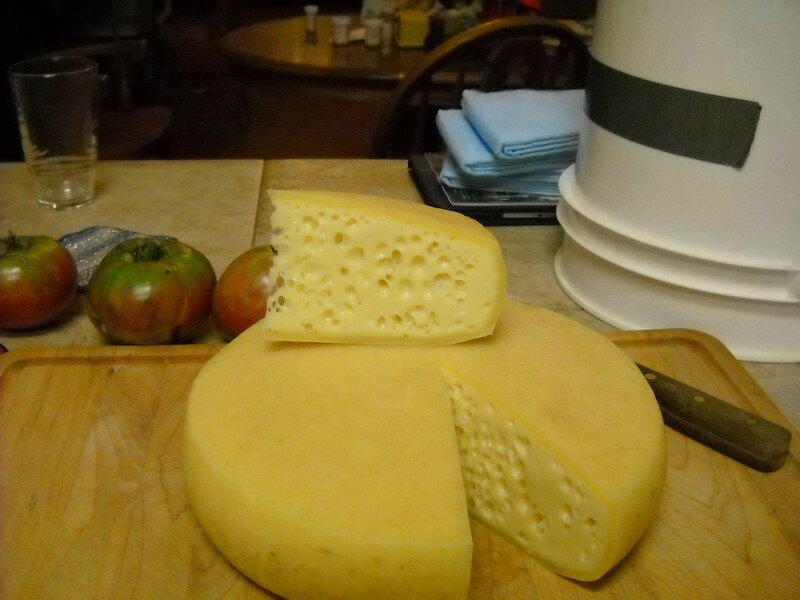 For a cheese this size (1kg or 2.2lbs) the eyes were about the right size. 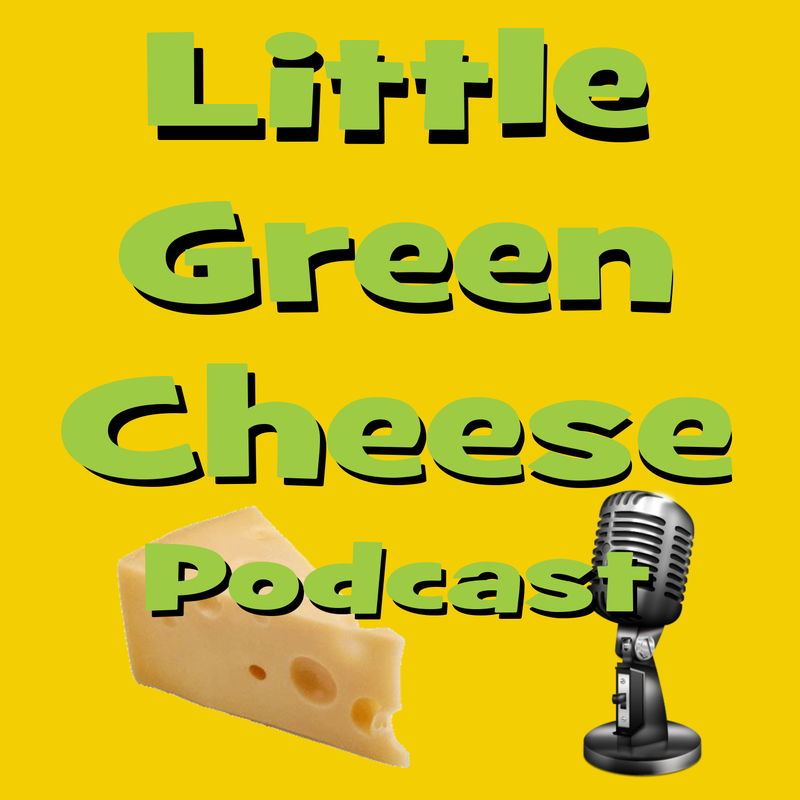 Those big eyes that you see in commercial cheese is because the wheels are about 60-70 kg. The bigger the cheese, the bigger the eyes. The cheese was firm and smooth to cut. As I cut it into quarters for storage, I noticed that the eyes were throughout the cheese, with was a very good sign. It sliced very well, and I could get it quite thin. Taste; The cheese tasted just how it was supposed to. Nutty, creamy, with a very slight parmesan style aftertaste (which is the thermophilic starter culture at work). Simply delicious. Kim said that it was my best Swiss style cheeses yet. 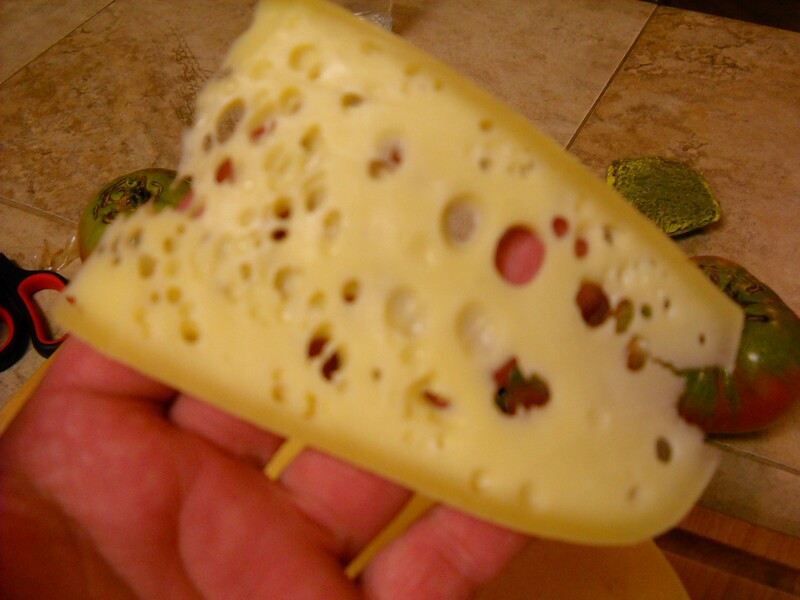 It was much better than some of the store bought swiss cheeses I have sampled, which I find lack body and taste. This one was head and shoulders above the pack. Verdict; Double thumbs up with five big gold stars. I never cease to amaze myself when it comes to cheese making. Just look at those remarkable eyes in this close-up below. The colour is not really that yellow, as the flash on my camera distorted the final shade. It is more like the photo above, an off white creamy colour. The vac-packing certainly helps to retain moisture and keep away unwanted moulds. The great thing is that once I remove the cheese from the packaging, I repack a half of the cheese in the same bag for storage in the normal fridge. I find myself using this method of maturation more and more, especially for those longer maturing cheeses. Waxing has its place, don’t get me wrong, but so does vacuum packing. So that is the LGC School of Swiss Cheese tasting. What lesson did you learn today?